Some driving ranges offer targets to help players with accuracy and figuring out the distance that they can hit their clubs. Driving ranges offer golfers a place to practice golf without the investment in time required by a full round. Playing 18 holes on a golf course usually takes a minimum of about four hours – and often longer. However, it is possible to effectively practice on a driving range in as little as a half hour. Driving ranges also offer other advantages, including greater accessibility and lower cost. 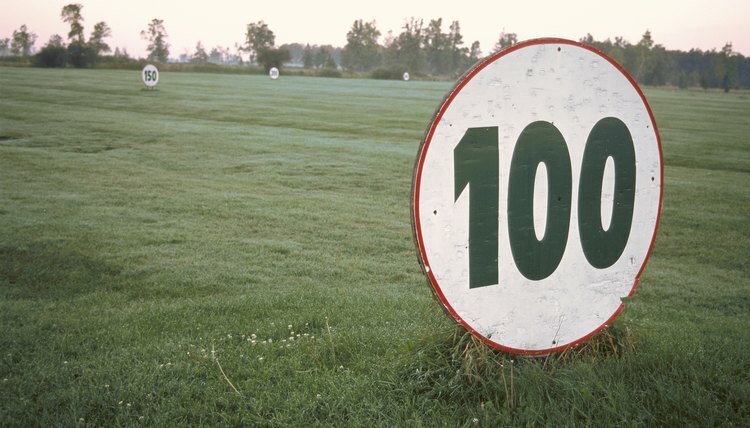 Golfers new to the sport find may find driving ranges less intimidating than a golf course. Golfers practicing on a driving range can work on their game without the pressure of keeping score or competing against others. Some driving ranges are lighted, offering golfers an opportunity to practice at night. Most golf courses are not lighted, making access limited for people who work during the day. Availability during winter months is also an advantage in some areas. Many golf courses in the North close in the winter, while some driving ranges remain open with hitting stalls that are heated and covered. Some driving ranges offer lessons by PGA and LPGA professionals. Golf courses also offer instruction, but usually only during the daytime. Instruction is possible at some driving ranges at night and during the winter when many golf courses are closed. Costs for using a driving range can vary depending on the facility; however, practicing at a driving range is usually less expensive than playing a full round of golf on a course. That is an important consideration for golfers who want to hone their skills but are on a limited budget. Golf courses that charge as much as $100 or more for a round of golf typically charge $10 or less for a bucket of balls. All-day use of the driving range also may be offered by courses for a reasonable rate that is still much less than 18 holes of golf. Driving ranges allow greater flexibility for practicing. Most golf courses do not allow extensive practicing on the course. That makes it impossible for a golfer to practice hitting a driver 75 times in an hour or two on a golf course. On a driving range, a golfer can practice as much as he wants with any club. Locate the best driving ranges in your area by inquiring at the pro shop of your favorite golf course, or by asking fellow golfers. Some driving ranges even offer special technology, such as hitting stalls that automatically load golf balls for you when you are practicing hitting your driver off a tee.